In meditation, yoga and life, we all have our edge. Our edge is the place where we feel interested but not excruciatingly uncomfortable. For me personally, I have a big edge about anything related to animal abuse but then again I am also partial to saving the humans along with the whales, stray dogs and innocent kittens. Yesterday, I returned from a week-long trip with my mother and a group of women from the Colonial Dames of Georgia. It was an unlikely pairing of well-to-do women with a few of their husbands visiting one of the poorest places on the face of the earth – certainly not the most impoverished locale but for me at least a place where I found my edge vis a vis saving the humans. Ever since President Obama announced that he wants to normalize relations with Cuba, people have been curious why my mother and I would want to visit. I posted photos from the island on my Facebook page whenever I could get a half-way decent internet connection and received much feedback. “What did you think of Cuba?” people eagerly ask me. Here is my bottom line. After we visited a bodega where people go to pick up their monthly rations for the government, I cried for an hour. 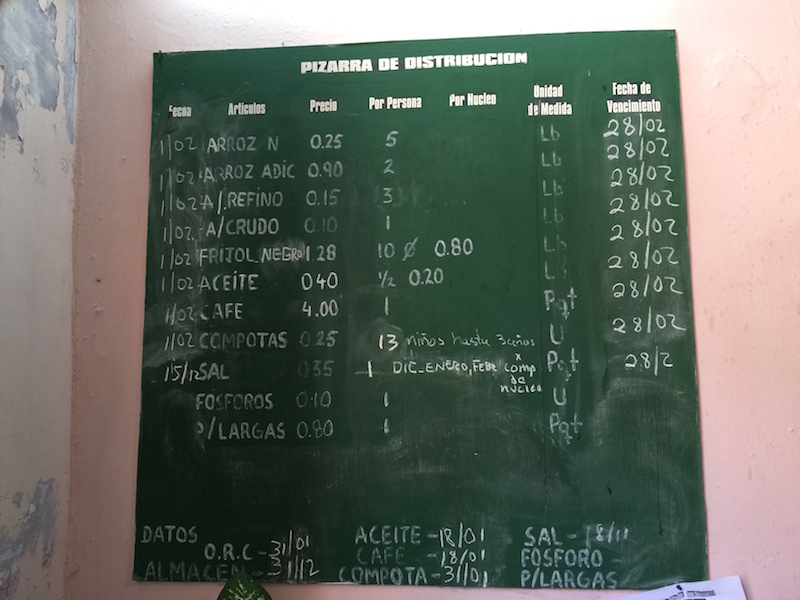 The small store in Havana is so behind the times they posted everyone’s monthly allowances in chalk. How much rice and beans, how many eggs, how many pounds of coffee and basically how much of nothing Cubans get to eat day after day, week after week, month after month while we here in the U.S. dine on a vast smorgasbord. As a long-term nutritionist, I am well aware of the issues we here in the U.S. face about food, where 68.5 percent of adults are overweight or obese. Overeating, food addiction, food allergies, food sensitivities, orthorexia, anorexia, bulimia, life-long dieting, fasting, detoxing, you name it, I have dealt with all these conditions in my clients and then some. On top of the vast wasteland of unresolved emotions about food come the professional nutrition lecturers who make everybody feel guilty if the food they are eating is not organic, kosher, gluten-free, dairy-free, soy-free, egg-free, vegetarian, paleo, local, unprocessed or homemade. Last year, I attended a four-day food healing training with a lecturer who insisted that making smoothies with fresh fruits and vegetables is way healthier than merely juicing them. He made me feel downright stupid or at the least less than noble that I had been merely juicing the produce from my all-organic, chemical free, hand raised garden rather than making smoothies. “Juicers aren’t as healthy as people who make smoothies,” he said to me, literally looking down on me from the stage where he held forth before his audience, as if I wasn’t part of his cool club. And then of course there are those who struggle to survive day in and day out. On our recent trip, we learned that the average Cuban makes the equivalent of about $20 a month while the average Cuban family needs about $300 a month just to make ends meet. People hitchhike hours every day. The Cuban government even has a local official called “the yellow man” – a guy dressed in a mustard yellow uniform who hangs out at bus stops – to help you get a ride with complete strangers. I asked one tour guide what he wants from normalization of relations and he basically said to retire. His 83-year-old father has to keep working in order to survive even though he has several sons who give him money to try to make his life easier. What would it be like to visit your local Whole Foods, Kroger, Publix, Trader Joes, Costco, Walmart, Fresh Market or where ever you buy your food and you saw a photo of President Obama and were told that your choices today – and from now until forever – were just rice and beans, six eggs a month and a few other staples that will only last you 10 days a month? Next time you are standing in front of your freezer, contemplate this – we are nowhere close to starving. I have always been an extremely grateful person. I thank God I live in the U.S.A.
Later, while riding in our tour bus through Havana, we saw a billboard that basically said in Spanish: “Blockade, the greatest genocide in history” (a true affront to anyone with Jewish ancestry), as if somehow our country was the cause of all this pain and suffering. I can only pray that the normalization of U.S. relations with Cuba will bring about more opportunities for ordinary Cubans. Next time anybody thinks communism or socialism is such a great idea, try living in Cuba and feeding a family of four. I have a Cuban friend in Chile. He left Cuba with only $40 and has managed to make a life for himself in Chile. He still has family in Cuba, but has only returned once. The minute he set foot there, he was considered an “enemy of the state” because he had defected.